A range of beautifully designed Herdwick Tweed bags and accessories designed and made in The Lake District. The name Herdwick comes from the Old Norse herdvyck which literally means sheep pasture. The quality of the wool produced by Herdwick sheep is unique in its durability. It has protective properties, making it a robust and hardy for practical uses. Herdwick sheep have been known to survive under blankets of snow for three days with only their thick coats for warmth and sustenance. 95% of Herdwicks live within 14 miles of Coniston and they are an important part of Lakeland heritage. In 2012 Lakeland Herdwick meat was given Protected Designated Origin (PDO) status. This is a European Standard of Food Protection which ensures the quality, provenance and traceability. Values that we uphold at Herdwick Limited. brought to Britain with the Nordic settlers during the Viking invasions? arrived in a Spanish Armada ship? whichever; by the end of the 12th century they were firmly established in the Lake District. Herdwick sheep can live all year on England's highest and roughest terrain which also has the country's highest rainfall! The heart of Herdwick country is the western and central parts of the Lake District National Park. Much of the farmland is unfenced fell grazing and includes large areas of common land. Lakeland Herdwick lambs learn through shepherding and grazing with their mothers where on the open fell their farm's grazing area is. This is known locally as the "heaf". It's a complex system dependant on succeeding generations of female sheep being taught where they live. These Herdwick's feed on the herbage of the fells; grasses, heather and plants such as bilberry. They maintain the unique landscape that is now a UNESCO World Heritage Site. Beatrix Potter’s love of animals extended beyond the pages of her quaintly drawn books. When she married and moved to Castle Cottage, Near Sawrey in 1913 she already had an established reputation as an artist and author. When she became Baetrix Heelis she embraced a new and engrossing occupation. Having bought more farms after her first purchase of Hill Top in 1905, when she finally moved to the area she developed her passion for the Herdwick breed. 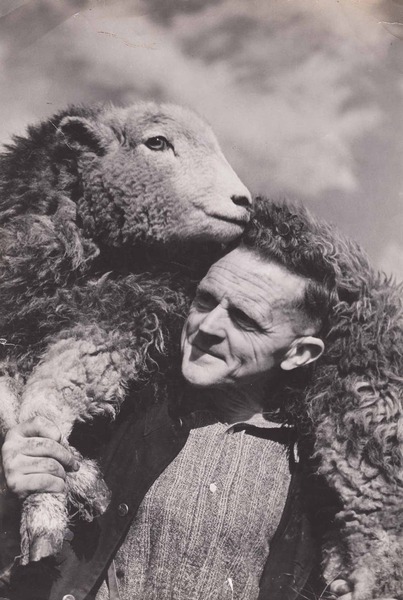 She employed Tom Storey as her shepherd to breed prize winning sheep, becoming something of an expert in the process. This was recognised when she was elected to be the first female president of the Herdwick Sheep Breeders Association for 1944 but unfortunately she didn’t live to take up the position. On her death she bequeathed all the farms and land she owned to the National Trust, stipulating that each farm must maintain a flock of pure bred Herdwick sheep. Herdwick sheep are born completely black but slowly their fleeces lighten to chocolate brown with a snowy white face and legs. The first sheering at around 15 months removes the thick brown fleece revealing a dark grey colour below. Every summer as the fleece is removed the layer below is lighter until the mature adult is light grey or cream. These beautiful natural tones echo the bleak beauty of the landscape of The Lake District. Shearing occurs once a year, during the summer months. As the summer temperature rises the removal of their heavy coats is very welcome to the sheep and it is essential for their welfare. Even with the electric clippers that are used today it is still a very physical and skilled job.